Lindenhof is both a district in Zürich and a square of the same name and looks back on an eventful history. The district is the oldest part of the city and once, a Roman fort stood in its place on the hill. At Lindenhof Square, a Roman tombstone was found containing the oldest mention of the city, back then a customs post with the name Turicum. Even after the fall of the Roman Empire, the Lindenhof kept playing an important role in the city’s history. In the 13th century for example, Zürich was in a war against Winterthur and ran out of warriors. It was then that the women of the city dressed up as soldiers and stood on the raised Lindenhof, giving the impression that a strong army had come to the city’s rescue and thus, breaking the siege. A fountain in the center of the square still pays homage to this heroic deed, showing Hedwig, the leader of these women. In the following centuries, the square kept serving as a place of assembly and in 1798 it was here, that the citizens of Zürich swore their oath to the Helvetic Constitution. Today, the Lindenhof is a green oasis in the heart of Zürich, from where one can enjoy a wonderful view over the old town, the Minster, the River Limmat and the University. But not only tourists come here to enjoy the perfect overview over historic Zürich. It is also a popular place with the locals, who often can be seen sitting on the many benches beneath the linden trees and taking a break from everyday life. Passionate chess players meet here to play long matches against each other amidst the tranquility of the trees and old buildings and regular theatre productions are held under the open sky. The Lindenhof district is located on the western side of the Limmat, right before the river empties into the Lake Zürich. Lindenhof Square, which can be found close to Rennweg, can only be accessed on foot through the narrow streets of the medieval old town. Delve into Switzerland’s colorful past and discover top Zurich attractions on this 2-hour Zurich walking tour. Follow your guide along the beautiful Bahnhofstrasse, where locals mingle in bustling boutiques, art galleries and cafes. Head towards Lindenhof, and discover local landmarks including the City Hall, St Peter Church and the Limmat River. 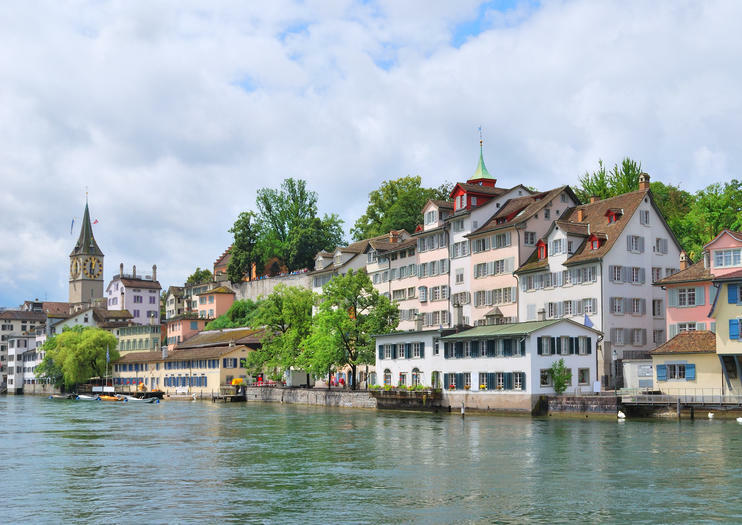 Gain insight into Zurich’s 16th-century silk industry in Schipfe and stroll the winding alleys of Niederdorf in the Old Town, home to the attractive churches of Fraumünster and Grossmünster.